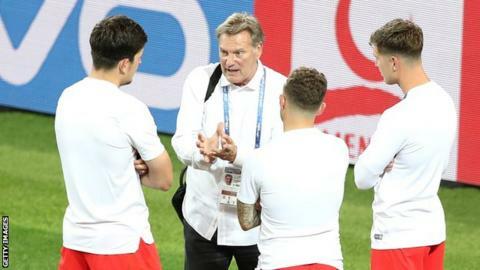 Ex-England and Tottenham manager Glenn Hoddle is “responding well” to treatment after being taken to hospital in a serious condition on Saturday. Hoddle was taken ill after appearing as a pundit for BT Sport earlier in the day on his 61st birthday. “The condition is serious but Glenn is receiving specialist treatment and responding well,” a spokesman said. Hoddle earned 53 England caps and is considered to have been one of the best players of his generation. BT presenter Jake Humphrey earlier confirmed Hoddle was “taken seriously ill at the BT Sport studio this morning”. The spokesman added: “Earlier today Glenn collapsed at the BT Sport studios – he received immediate medical attention on set and was transferred by paramedics to a hospital in London. As a player, Hoddle won the FA Cup and Uefa Cup with Tottenham and also had spells with Monaco, Swindon and Chelsea. Hoddle became player-manager at Swindon and Chelsea, and is credited with turning the west London side into a cosmopolitan outfit by signing Netherlands great Ruud Gullit, who went on to replace him as boss at Stamford Bridge. From there he managed England for two and half years, taking them to the 1998 World Cup, but his reign ended in controversy when he admitted a “serious error of judgement” after suggesting disabled people were being made to pay for the sins of past lives. He went on to manage Southampton, Tottenham and Wolves, before continuing coaching and his career as a TV pundit. Former Spurs team-mates were quick to send their support to Hoddle on social media.